Tara Strong, Daran Norris, Susanne Blakeslee et al. You can stop wishing for all 19 full episodes of the complete third season of The Fairly OddParents - and begin watching Timmy Turner wish himself into more trouble than ever before! This chaos-filled season sees Timmy working with magical beings like the Tooth Fairy and Cupid...getting a visit from Mark Chang, whose planet of Yugopotaimia has been invaded by a sweet, cuddly race of creatures known as Gigglepies... and swapping voices with pop-star Chip Skylark! 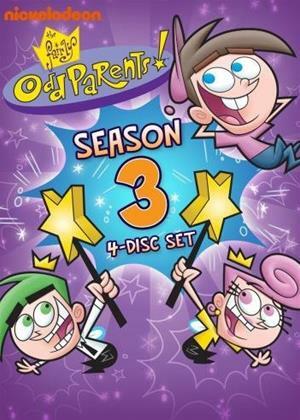 There's more magical madness too, so join Timmy, Wanda and Cosmo - and guest stars Jay Leno as the Crimson Chin, Jackie Mason as Sandman and Chris Kirkpatrick as Chip Skylark - in the remarkably mystical town of Dimmsdale for all the Season 3 adventures of The Fairly OddParents!